Troy Trojans quarterback Kaleb Barker (7) gets away from pressure from Boise State Broncos nose tackle Sonatane Lui (98) during the second half at Veterans Memorial Stadium. Bryan Harsin points out that "everybody's like that" at this time of year. But Boise State sure does seem to be beset by an unusual number of key injuries. 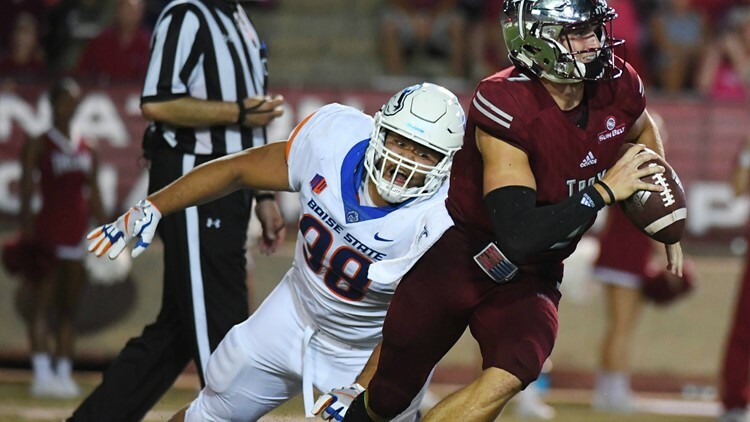 There was some shuffling on the Boise State offensive line at Nevada, some out of necessity and some by choice. When right tackle Eric Quevedo was injured at the end of the first quarter, Isiah Moore came in at right guard and Andres Preciado slid out to tackle. Then the Broncos opted to lift Preciado in favor of redshirt freshman John Ojukwu, the Boise High grad. Harsin thought Moore and Ojukwu played well, especially on the final drive that lasted eight minutes-plus. “John Ojukwu was practicing really well this past week,” said Harsin. “I felt it was time to get him going.” Quevedo, by the way, is also in the “not a season-ending injury” camp. Harsin did enough gambling in Reno Saturday night to ask for a key to the city. You could tell he was still excited about it yesterday. “That felt good,” said Harsin. “To go for it on fourth down—and get ‘em.” Boise State converted two of three fourth down tries, and the two it got could not have been bigger. On fourth-and-six from the Nevada 36 in the third quarter, Brett Rypien hit CT Thomas for the go-ahead touchdown. Then, of course, on fourth-and-eight with about three minutes left, Rypien hit Thomas for the game-clinching first down. Again we rewind to last year, when the Broncos were just 3-of-17 on fourth down for the season. Now they’re 8-of-12, with their 67 percent success rate tied for 25th in the country. Two former Boise State quarterback commits are on the schedule between now and the end of the season, Zach Wilson of BYU and Jalen Greene of Utah State (Greene is now a wide receiver at USU). A third who was heavily-recruited by the Broncos visits this Friday night in the form of K.J. Carta-Samuels, who is starting now for Colorado State. Carta-Samuels was a recruiting target of Harsin in the month after he took over for Chris Petersen in 2014. Carta-Samuels opted for Coach Pete and Washington, but he was never able to supplant Jake Browning and landed at CSU as a graduate transfer. Carta-Samuels actually made his college debut on the blue turf with the Huskies in 2015, taking a few snaps in the 16-13 loss to Boise State. Wilson reneged at the 11th hour last December and committed to BYU. And last week he became the Cougars’ new starting quarterback in place of benched senior Tanner Mangum, the Eagle High grad. Wilson’s first start was in a 49-24 rout of Hawaii Saturday night, as he threw for 194 yards and three touchdowns and ran for another TD. Does the win look better than it really was? Only time will tell. Despite their unexpectedly hot start, the Rainbow Warriors had warts. They came into the game ranked 88th nationally in total defense, 66th in rush defense, 98th against the pass, 114th in pass efficiency defense and 85th in scoring defense. Wilson’s pass efficiency rating was the highest ever for a BYU freshman QB in a start (167.2), breaking a mark set by Mangum against Boise State (162.7) three years ago. Three Mountain West teams are receiving votes in the polls, and I’m not sure they’re in the correct order. San Diego State is bubbling under in the AP and Coaches Polls, while Utah State is surging behind the Aztecs, and Fresno State is also receiving votes. I’d put the Aggies at the top of the heap right now after their 59-24 annihilation of UNLV Saturday, while San Diego State was fortunate to get by Air Force 21-17 Friday night. USU had routed BYU in Provo 45-20 the week before. The Cougars then turned around and pounded Hawaii, the Mountain West Cinderella, on the same field. With that said, Fresno State is proving to have the best defense in the conference this season. Dirk Koetter referred to a particularly painful episode in Boise State football history yesterday when he fired old friend and colleague Mike Smith as defensive coordinator of the Tampa Bay Buccaneers. Smith was Atlanta’s coach when Koetter was the Falcons’ offensive coordinator—their chain-of-command roles switched when Koetter hired Smith with the Bucs. Tampa Bay allowed 416 yards to, coincidentally, Atlanta Sunday in a 34-29 loss. Koetter called firing Smith the "second-most difficult" thing he has dealt with during his coaching career, behind the 1999 death of true freshman Paul Reyna while Koetter was head coach at Boise State. It was a wrenching time, but 1999 was the the Broncos’ breakout season, and they haven’t looked back. Reyna has always had a symbolic stamp on their run. Idaho State’s bid to stay among the Big Sky’s 2018 elite came up short Saturday in a 44-37 overtime loss at UC Davis. The Bengals led most of the way and were up 30-14 early in the third quarter before the Aggies rallied to tie it 37-37 with 1:09 left in the game. ISU quarterback Tanner Gueller marched the Bengals to UC Davis' 10-yard line in 64 seconds, but Campbell Sheidow missed a 27-yard field goal as time expired. Yes, it was one of those. Dan Hawkins and the Aggies, who are 5-1 overall, are now all alone on top of the Big Sky at 3-0. They’re up to No. 16 in the FCS Coaches Poll; Idaho State is stull receiving votes. Jon Rothstein, CBS Sports Network’s hoops insider, reports that “the Atlantic 10 and Mountain West have had initial discussions on an annual ‘challenge’ between the two conferences.” The Missouri Valley/Mountain West Challenge ends after this season (Boise State plays at Drake on November 27). The Atlantic 10 would bring some newness to the schedule. The conference includes Davidson, Steph Curry’s alma mater, George Mason, the 2006 Final Four Cinderella, and LaSalle and Dayton, both of whom the Broncos have played in the NCAA Tournament’s First Four. Before you think this would be an upgrade, though, know that the NCAA’s final conference RPI rankings last April had the Missouri Valley eighth, the Mountain West ninth and the A-10 11th. Second baseman Bobby Richardson catches Willie McCovey’s wicked line drive with two outs in the bottom of the ninth and the winning runs in scoring position, as the New York Yankees hold on to beat the San Francisco Giants in the seventh game of the World Series, 1-0. I was in a sixth grade classroom in the Bay Area, where everything had shut down to watch or listen to the drama. That day, there was indeed crying in baseball.